Richard Hughes loves the atmosphere in the Wellbeing Centre at Wirral Hospice St John’s. He’s well up for a laugh and a joke. He’s got loads of great stories, which he’s more than happy to share with us. He was born in 1940 in Paignton, Devon. His dad, Frank, was a waiter on, what is now fondly called, The English Riviera. Sadly, Richard’s mum died when he was only 15 months old. When his dad met and married a new lady, “a wonderful woman who brought me up, Marguerite”, he had no real recollection of his birth Mum, Eva. In later life, Richard and his family have traced Eva’s resting place to the picturesque village of Collaton St Mary, in South Devon. They’ve had a memorial plaque sited there in her honour and revisit the spot as often as possible. Richard spent most of his childhood growing up in Liverpool. (His dad had moved to work for Napier’s, later English Electric (now BAE), which manufactured aeroplane engines and motor cars but also made ammunition for WWII). Richard’s a keen sportsman loving football, cricket and also, notably, basketball. In 1954, Richard was in the Prince Rupert school team which won the All Liverpool school’s championship. Richard met his wife, Pamela, by a massive coincidence, in Torquay, near, you guessed it, Paignton in Devon! Richard was on a holiday with his cousin revisiting the area where he was born and Pamela was living with her family in this most beautiful part of England. They were soon courting and married in 1966, at St John the Baptist Church in Tuebrook, Liverpool. Now, more than fifty-two years later, Richard simply says of Pamela, “I just love her to bits”. (Here’s Richard and Pamela pictured on the right). They’ve got three daughters, Maria, Julie and Jennifer, and seven wonderful grandchildren, “The Magnificent Seven,” Richard warmly exclaims. The growing family moved out to North Wales, first to Queensferry and then onto Colwyn Bay (it had been recommended that they move nearer to the sea for middle daughter, Julie, who had severe asthma). They spent 30 happy, very busy, years there. The house in Colwyn Bay had eight bedrooms and, for six of those years, they ran a popular B&B. It must have been brilliant as Richard tells me of the Irish people who came to stay for one night and ended up staying for 3 weeks! Richard would prepare breakfast, then go to work in the local supermarket, back to serve dinner and then off to work in the evenings in a local pub. Now, that’s a full schedule!!! They all became entwined in life in North Wales. Richard is proud to have been invited, with Pamela, to the 25th anniversary of the investiture of Prince Charles, as Prince of Wales, in Caernarvon in 1994. A back problem, leading to spinal fusion for Richard, saw a change in direction, workwise, for the family. Pamela went to teach at Llandrillo College and Richard returned to college to study! After achieving his British National Diploma (BND) in public services. He joined the North Wales police service as a civilian officer. He worked in traffic and then in the crime statistics department. As a steward in NALGO (now UNISON) he endeavoured to improve the lives of all the support staff. Richard loved the camaraderie of the workplace. Organising various trips, with theatre visits, days out to other parts of Wales, stately homes in England, London excursions and even a vacation in New York. All in all, another twenty three happy years. Richard and Pamela enjoyed rambling. (Richard is captured here in his full walking accoutrements). There are some beautiful places in North Wales, and around Wirral, where such passion for striding out can be indulged. It was while in the North Wales police that Richard organised a walk to celebrate the millennium. People from all the police forces in the UK were invited to take part and eventually, 275 hardy souls set off on the, circa, 25 miles from Clwyd Gate, near Ruthin, to the coastal town of Prestatyn. He gives great credit to Pamela for all the organisation and support. “She’s the greatest administrator, EVER!” He says proudly. With the first one under their belt subsequent years became more popular, with the £10 entry fee going to the British Red Cross. Other people would also raise money for their own charities. Rock and Roll nights added to the fun, following the walk, which became, ‘The Walk you’ve been waiting for, from Mountain to the Sea’. After moving to Irby in Wirral in 2006, Richard and Pamela continued with their love of walking. He became Walks Secretary of the Heswall Midweek Ramblers and they’ve completed many charity walks, including Hadrian’s Wall and a Metropolitan Police organised event in Windsor Great Park. His weekly visit to the Wellbeing Centre sees him enjoying, often instigating, the banter while taking part in all the other activities he likes. (Richard’s pictured on the right here with our Wellbeing nurse, Lesley.) From jigsaws, other pastimes, group and individual discussions, quizzes and ‘play your cards right’, to physio and other helpful strategies and therapies to help with managing his condition. Outside of the hospice he loves visiting his “favourite city”, Liverpool. Trips to the Walker Art Gallery and the Museum of Liverpool Life, (where son in law, Simon, helped install the IT systems) are especially enjoyable. Richard’s feeling for the hospice staff and volunteers goes beyond admiration, he has a genuine fondness for them. He looks forward to his weekly visit to the Wellbeing Centre, “They’re all, simply, brilliant”, he says. When I check with all those who see him every Tuesday, I can assure Richard that they all say… the feeling is mutual! It really is, Richard, it really is! If you’re looking for an event that’s a bit different, active and very entertaining, then take a look at Zorbing Football! Zorbing is becoming increasingly popular for those into their fitness – you’ll see zorbs being used in many boot camp classes and for those just looking for a bit of fun! You can ‘harness zorb’ and speed roll down a hill at 30mph, ‘aqua zorb’ and have complete movement inside a zorb which is pumped with around 30 litres of water and of course, zorb whilst playing a glorious game of football! Interested? Of course you are! Type ‘zorbing football’ into YouTube and we guarantee you’ll be inspired to try it! With this in mind, we’ve decided to bring the fun to you and will be hosting a Zorbing Football Tournament on Saturday 11th July at Croxteth Leisure and Wellbeing Centre, 10am-12pm for those adventurous enough to have a go! 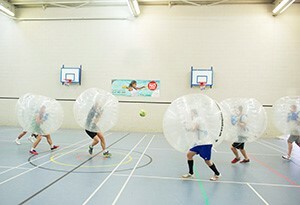 The event begins with a safety briefing and practice session, where players will get used to the zorb suits. This means you will be running around bumping and crashing into each other. When you have the feel for your suit, the fun can truly begin! Rather than tackle, use the more effective barge to win the ball off your opponents, sending them flying end over end in the process. When in control of the ball, if you can stop yourself howling with laughter for long enough, dribble it forward before smashing it home past the goalie, but beware, a barge could come from any direction! The event will finish with games including Zorb Bulldog / Last Man Standing and a zorb crossbar challenge! Whether you enter as a team with your friends or an individual, you are guaranteed to enjoy this hilarious version of the beautiful game! If you would like to find out more about what we have planned for 2016, visit our fundraising and challenge events pages on our website.